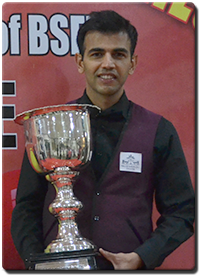 - 2015 Jubilee Hills International Club Centre Twin State Open Billiards & Snooker Event - Winner Billiards & Snooker. - 2015 MCC Kumbhat All India Invitation 6red Snooker event - Semi Finalist. - 2015 RKG Pro Ranking Series East Zone - Kolkata - Semifinalist.